1 in 4 of us with deal with some sort of mental health issue at some time in our lives. Yet these remain health concerns with a lot of stigma, and misunderstanding surrounding them. World Mental Health Day seeks to address some of the issues. Now in its seventh year, each year has a theme and a focus, this year being Older Adults. The Mental Health Foundation page for this year is here. On our site, an article from earlier this year looked at Natural Support for Stress, Anxiety and Depression this provides a range of useful ideas suitable for all ages. On our Facebook page, we always provide lots of free resources and health ideas. 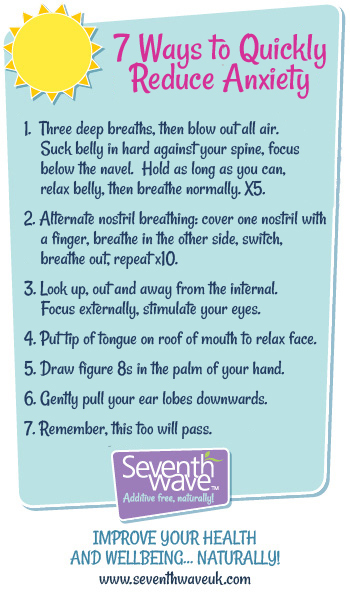 Our "7 Ways to Quickly Reduce Anxiety" featured today as part of mental health day. Anxiety is the most common mental health issue, affecting as many as 20% of people at any one time.